There are many factors that can cause or predispose to neck pain. One of the most common problems we see with chronic neck pain sufferers is a faulty breathing pattern. What has breathing got to do with neck pain? A normal breathing pattern is driven by the diaphragm (the muscle that sits under your lungs). With an ‘in’ breath the diaphragm should contract downwards, inflating the lungs. This filling of the lungs pushes the abdominal organs down leading to expansion of the abdomen. This is called a ‘diaphragmatic’ or an ‘abdominal’ pattern of breathing. 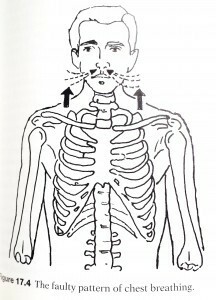 In many neck pain patients this pattern of breathing is dsiturbed. 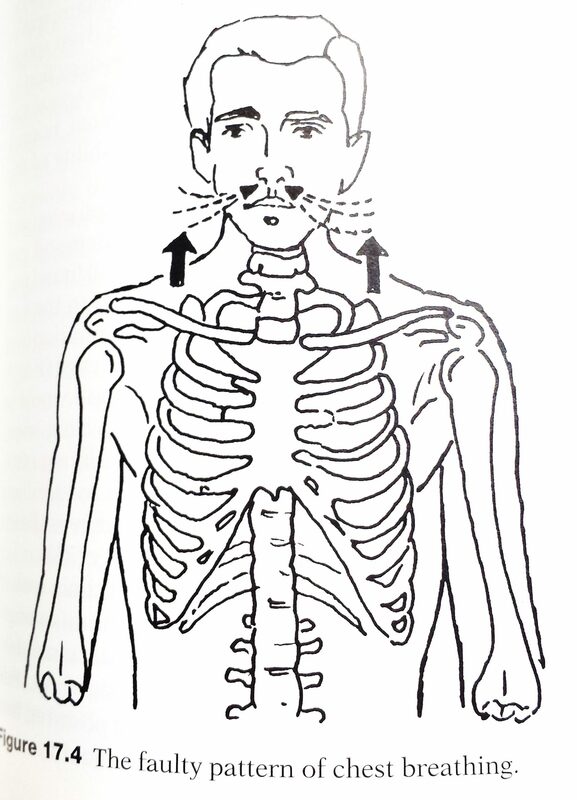 Instead of the diaphragm expanding the lungs from below, the muscles of the neck and shoulders lift the ribcage up. Breathing in this fashion overloads the muscles and joints of the neck, which can predispose to pain and injury. Sit or lay comfortably and breathe normally. 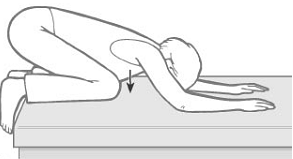 Place one hand high on your chest and the other on your abdomen. Observe where your breathing takes place. Are your chest and shoulders tensing lifting as you breathe in? If you find it difficult to breathe without tensing or lifting your chest and shoulders Rainbow Breathing is a simple but effective exercise that can help to reset the normal pattern of breathing to unload the muscles and joints of the neck thereby reducing pain and tightness. Start on all fours with your knees wider than your feet. Slowly drop your hips back towards your heels as far as comfortable and let your shoulders and stomach relax. It can help to think about dropping your stomach to the floor. Next, take a relaxed breath in, expanding the stomach and sides of your ribs. You should feel you stomach move into your thighs but you shouldn’t feel your shoulders lifting. Breathe out, again focus on relaxing the stomach. Repeat this breathing cycle for 3-5 minutes, 3-5 times per day. Once mastered you can integrate this pattern into your daily postures and movements – sitting, driving, standing, and walking before progressing onto more advanced exercises. Other tips (including alternative exercise for neck pain) can be found here. “Rainbow Breathing Exercise for Neck Pain” was written by Steffen Toates. Steffen is a chiropractor at Dynamic Health Chiropractic in Jersey, Channel Islands. For more information about Steffen click here.